STAT is one simple option that could help you achieve your goal of commencing a university degree sooner. applicants to any course for which STAT scores are considered (check current course guides). STAT is an aptitude test that evaluates verbal and quantitative reasoning. Specific curriculum knowledge is not required. WHICH UNIVERSITIES ACCEPT STAT RESULTS? Requirements vary from state to state within Australia. Individual institutions set their own admission requirements. Refer to the current university course guide. Universities/course authorities may impose age restrictions. Candidates should check with the institution to which they are applying to determine if their STAT results will be accepted. As a general rule, an applicant must be 18 years or over by a certain date in the year of admissions to use STAT results in their application. WHERE SHOULD I SIT STAT? STAT results are comparable no matter where in Australia you sit the test and results are accepted Australia-wide. If possible, you should sit the STAT in the state where you reside, even if you plan to attend university in a different state. WHICH TEST(S) DO I SIT? Refer to the current university course guide. Course authorities set their own admission requirements. They are the only authority that can advise if they will accept STAT results and which test(s) are required (eg Multiple Choice only or Multiple Choice and Written English). Generally STAT Written English is only required by institutions in WA, Vic/Tas and NSW/ACT. HOW MANY TIMES CAN I SIT STAT? 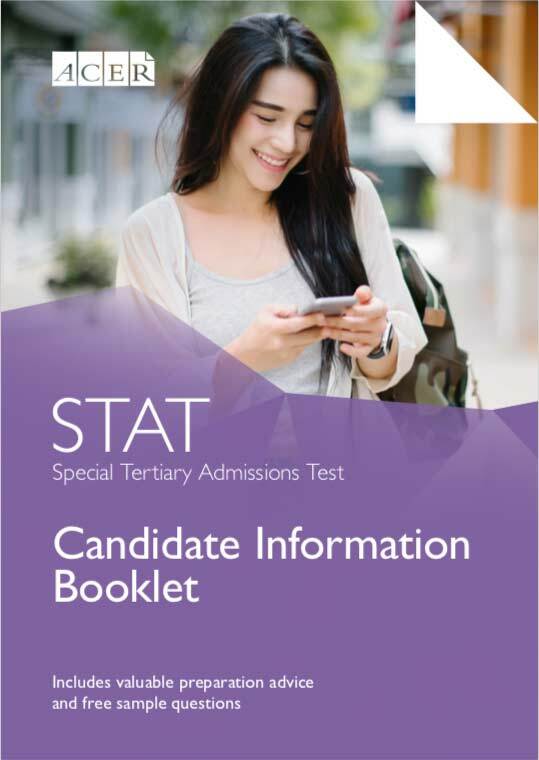 Candidates may only sit STAT once per test cycle, which runs from 15 April to 14 April of the following year. The current test cycle is 15 April 2019 to 14 April 2020. CAN I SIT STAT OUTSIDE AUSTRALIA? The only option for sitting STAT outside Australia is Online Testing. Please refer to the Online Testing page for more information. WHAT DO I NEED TO KNOW FOR THE TEST DAY? Please read our Test Day page for information about what to bring to the test, prohibited items and rules and misconduct. WHERE CAN I FIND OUT ABOUT STAT RESULTS? Go to the Results section of this website.